The night after Wrestle Kingdom 13 had some good matches, but the night was centered more on setting up new feuds for all the new champs. Some big statements were made tonight, though few real surprises were to be had. The Golden Lovers team with Yujiro Takahashi to take on Chaos, and the team of Beretta and Kazuchika Okada battle Juice Robinson and Hiroshi Tanahashi in another good show on the Road to DESTRUCTION. The Golden Lovers take on the Chaos team of Will Ospreay and Tomohiro Ishii in the main event of a good stop on the Road to DESTRUCTION. The Road to DESTRUCTION begins in Nagoya! B Block put on another set of highly entertaining matches in night four of the 25th Best of the Super Jr. tournament! 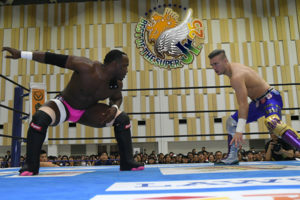 ACH and Will Ospreay deliver some great action in the second round of A-Block matches. The B-Block of the 25th Best of the Super Jr. tournament begins with four matches, highlighted by a very good main event battle between Marty Scurll and Hirmou Takahashi. The 25th Best of the Super Jr. tournament begins with a series of good matches including ACH vs Flip Gordon and Will Ospreay vs Tiaji Ishimori! The 2018 New Japan Cup ended with a fantastic, history-making final match! Listen to the final mini episode covering NJPW’s first big tournament of the year to find out who won and who he’s going to face for a title at Sakura Genesis! Zack Sabre Jr. and SANADA battle in a fantastic semifinal match in NJPW’s New Japan Cup 2018 to see who will move on to face Hiroshi Tanahashi in the final match of the tournament! The first semifinal match in NJPW’s New Japan Cup 2018 featured Juice Robinson facing his mentor Hiroshi Tanahashi in a hard fought battle that had both men searching for ways to prevail. Find out who moved on in the tournament and what took place earlier in the night’s tag matches that might be teases for some great title matches in the near future! The second half of the quarter finals of the New Japan Cup 2018 tournament delivered one of the best matches so far during the tour, as well as one of the shortest! Toru Yano looked for any way to beat SANADA and Zack Sabre Jr. looked looked to twist all of Kota Ibushi’s limbs in another very good night of NJPW wrestling! 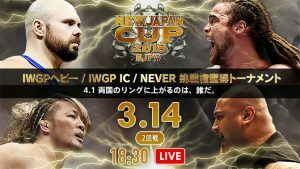 The quarter finals of New Japan Pro Wrestling’s New Japan Cup 2018 begins with Juice Robinson taking on Michael Elgin in an interesting battle of power and agility, and Bad Luck Fale versus Hiroshi Tanahashi in a slightly odd contest of power and wits! The first round of NJPW’s New Japan Cup 2018 comes to an end as four men battle for the final two spots in round two! It’s Toru Yano versus Davey Boy Smith Jr., and SANADA versus Chuckie T in a double main event that brought something new to the tournament matches so far. While the tag matches leading up to the main events of night three of NJPW’s New Japan Cup 2018 might not have been as strong as previous nights, the two tournament matches definitely delivered. Kota Ibushi faced YOSHI-HASHI in a surprisingly hard-fought match, and Tetsuya Naito tried to survive the technical wizardry of Zack Sabre Jr. in a great double main event. Juice Robinson attempts to defeat Michael Elgin and Bad Luck Fale takes in Hiroshi Tanahashi in the first two matches of the quarter finals of NJPW’s New Japan Cup! 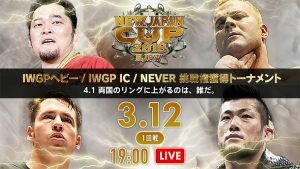 SANADA battles Chuckie T and Toru Yano tries to cheat his way to a victory over Davey Boy Smith Jr. in the final night of the first round of NJPW’s New Japan Cup 2018! 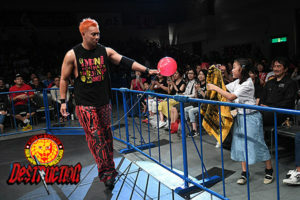 Night two of New Japan Pro Wrestling’s first big tournament of the year featured two more first round matches in which Lance Archer battled Bad Luck Fale and Taichi attempted to get past the ace of New Japan, Hiroshi Tanahashi. Listen to this special mini episode of the Wrestling House Show to learn everything that happened and everything worth paying attention to in the second night of the New Japan Cup! 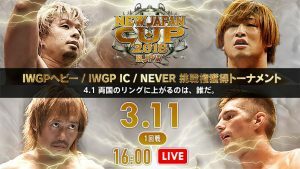 Kota Ibushi faces YOSHI-HASHI and Zack Sabre Jr. takes on Tetsuya Naito in two of the better matches so far in this year’s New Japan Cup. Join chris for a recap and review of night one of New Japan’s first big tournament of the year, the New Japan Cup! You’ll get the results and the highlights of everything that happened on the show, all in a shorter episode format for easy access and listening!